"People may begin to believe that they cannot keep themselves safe, cannot trust strangers, or are helpless." 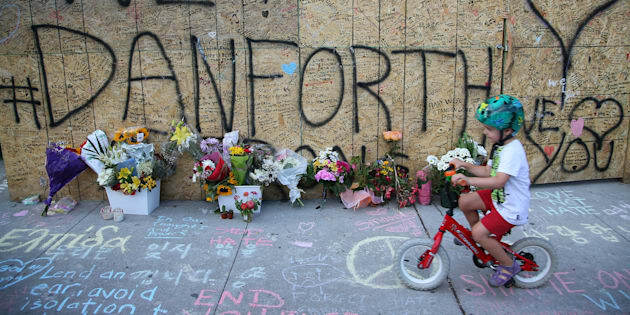 A boy passes messages written on construction boarding after a mass shooting on Danforth Avenue in Toronto on July 25, 2018. Acts of mass violence affect us all, triggering a host of emotions. Two incidents in Toronto within just a few months have left many reeling from feelings of fear, despair, disbelief, devastation, anger, deep sadness — and at a general loss for how to cope. Last weekend, a mass shooting in Toronto's Danforth left two victims dead and 15 people injured. Exactly three months before that, a van attack killed 10 people and injured 16. "Experiencing or learning about an event like Sunday's mass shooting can damage your sense of safety, trust, power and control," said clinical psychologist Dr. Jonathan Danson. "People may begin to believe that they cannot keep themselves safe, cannot trust strangers, or are helpless overall." Danson stresses that there's no right or wrong way to feel. "Everyone experiences and processes trauma differently, and rejecting or denying emotions as somehow 'wrong' can lead to unhelpful feelings of guilt and shame," he told HuffPost Canada in an interview. To begin processing such events, Danson recommends learning more by reading select articles from reputable sources to help you understand it, without overexposing yourself to videos or graphic images. "It's also completely OK to not want to learn more," he suggested. "However, people should be careful not to be too extreme in your avoidance such as avoiding all thoughts, emotions, or discussion of what happened." That can instead surface those feelings in the future, and make them sometimes more pronounced, he said. While the desire to avoid potential triggers is normal, Danson said in the long run, avoiding the site of a tragedy or refraining from going out after dark reinforces unhealthy beliefs, prevents people from living their lives, and ultimately increases fear. Gradually returning to normal activities can help build resilience and reduce fear over time. Give yourself permission to experience whatever emotions come up, even painful ones, Danson said. "Spending time with others going through similar difficulties can help remind us we're not alone, our feelings are normal, and that other people are generally good and trustworthy," he added. Contributing to a cause can help reduce feelings of helplessness. Donating to a victim's fund, advocating for better access to mental health care, or giving blood, for instance, can remind people that they have some control over our lives and our communities. Mourners share a hug during a candle light vigil near the site of the deadly Toronto van attack in April. Recognizing that recovery from grief and trauma can take time is also important, according to Jaylin Bradbury, a therapist at the Shift Collab clinic in Toronto. "Even though it may feel like it's been a long time for one person, it may still feel very fresh for another," she told HuffPost. Questioning what you could have done differently to prevent the attack or decrease the harm can hinder people from moving forward, she said. To break out of that, journalling or writing down your thoughts can helpful, as well as considering the things that you do have control over, such as your health and lifestyle choices. Exercise, for example, releases endorphins and other chemicals that fight stress and increases feelings of wellness. Friends of Julianna Kozis, one the victims of Sunday night's shooting on the Danforth, embrace during a vigil. "Our emotional reactions can often impact our ability to focus, maintain relationships, sleep, eat, or remain active, no doubt," said Bradbury. "But attending to your these basic needs has been shown to help people heal from traumatic experiences." She recommends refraining from potentially harmful or destructive behaviours such as binge drinking, substance use, or self-harm. "We often think these actions offer us temporary relief from distress, but they suppress our emotions or prevent us from processing how we truly feel, delaying the time it takes to heal and recover." If symptoms such as persistent distressing thoughts of the event, anxiety, depression, sleep disturbance, poor concentration, or low motivation continue for more than a few weeks, cause intense distress, or interfere with the ability to function normally (like going to school or work), it might be time to seek help, said Danson. A psychologist or other mental health professional can help you understand your reactions and to make choices that are best for your long-term well-being. If you've experienced trauma in the past, you might be at a higher risk to develop symptoms after an event like this, especially if you haven't developed healthy ways of coping. Those with other mental health concerns, such as anxiety and depression, are also at higher risk. Danson pointed out that some people can develop extreme beliefs such as "strangers can't be trusted," or that "Toronto is a dangerous city" and may be at higher risk for longer lasting trauma symptoms and should consider seeking professional help. Offer your support in ways that meet other's needs, rather than ways you like to offer support or would like others to support you. Danson says the best way to determine what someone needs is to ask them directly. "Some people need emotional support, which can include letting them know that their feelings are OK, that you understand how they feel or want you to share how you feel or that you're there for them," says Danson. "Others prefer informational support, such as reminders that Toronto is still a very safe city, or that these types of events are extremely rare." Reaching out to a therapist can be extremely helpful while coping with grief or sadness. Help them maintain some kind of normal routine. Offer to go to lunch, join them at the gym, or just take a walk. Try not to encourage avoidance behaviours, such as staying home or withdrawing from friends, or using unhealthy coping behaviours, such as using alcohol or drugs. Bradbury says remember the advice from Mr. Rogers who once said, "When I was a boy and I would see scary things in the news, my mother would say to me, 'Look for the helpers. You will always find people who are helping.'" Two people hug at a makeshift memorial in Mel Lastman Square in Toronto for the victims of the van attack before a vigil on April 29, 2018.